"If there is one thing that I’ve learned in my career, it is to do more of what’s working, and less of what’s not." Given the title of this blog and the fact that I have written a book called Doen wat werkt (which means Doing what works) you will not be surprised that I like this quote..
Ralph Waldo Emerson said: "Nothing astonishes men so much as common sense and plain dealing." So... 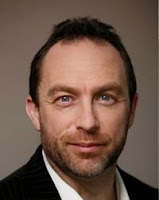 I guess Jimmy Wales learned that and as a result, astonished the entire world. Thanks for the lovely quote!